IT'S TIME for the federal government to create secure employment for everyone. Communities are prosperous when the skills of all its citizens are utilized. We all suffer from unemployment—whether employed or not. That’s because unemployment not only affects the individual that is unemployed but also their community. Unemployment negatively impacts both the individual (mental health, lifetime earning potential, increased likelihood of divorce and suicide) and the community (breakdown of social wellbeing). Regardless of physical ability, background, or age—every Ottawa resident has something valuable to contribute to society. Everyone deserves a chance to earn a living so that they can build a better life for themselves and their families. Many people are underemployed in precarious jobs that do not provide a livable wage. Unemployment and underemployment is especially high for youth, Aboriginal peoples, immigrants and people with disabilities. This is a growing marginalization of racialized communities which results in the increasing racialization of poverty. 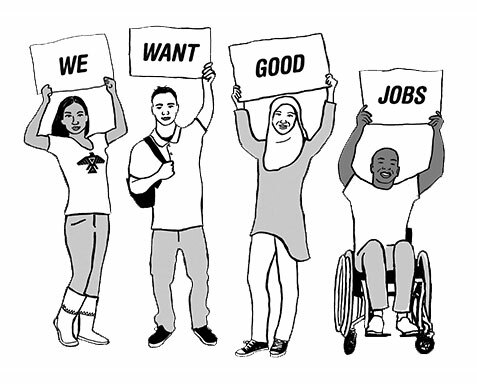 How will you support a National Jobs Creation and Training Strategy which ensures stable jobs with good benefits? What steps will you take to increase employment for youth, immigrants, Aboriginal people and people with disabilities?